- The ARK-1s provides visual acuity (VA) measurement. A glare source is projected beside the chart and the glare VA can be measured. 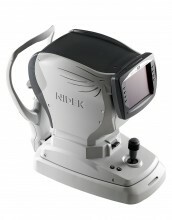 - The retro illumination image enables the observation of opacity of the optical media of the eye. - Objective measurement of accommodation is performed with patient's focusing on a target which moves from distance to near. - The mire ring is used to measure keratometry. It reduces eyelid artifacts. Click the button below to add the Nidek ARK 1S Automatic Refracto Keratometer to your wish list.